Dragon Eat Eggs is a great adventure game! Launch fireballs to the air to eat the eggs and collect coins. Watch out for toxic foods and dangerous piranhas! Multiple features such as egg upgrades, boosts and skills, leaderboard, Facebook share and more! Why is The Dragon Eat Eggs throwing up continually so many fireballs?? To satisfy his hungry stomach, the Dragon Eat Eggs decides to launch fireballs to eat eggs. An active dragon is hungry so he can enjoy an unlimited amount of eggs. He never gets sick of it! But the eager dragon just enjoys fresh food, he will run out of lifetime if he catches 3 toxic eggs or dangerous foods.... In addition, the Piranhas are lurking to catch him at any time so the hungry dragon has to carefully and selectively eat his eggs. He can acquire super powers when catching each special type of egg. For example, Catch the Magnet eggs, then get ready for a draw of more of these eggs released. - Multiple egg upgrades, skills and backgrounds. Open project by Unity and follow steps described in documentation file provided after purchase. 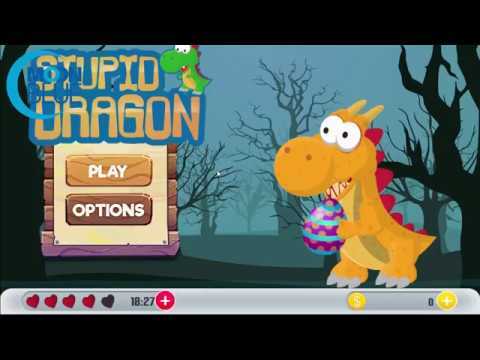 Stupid Dragon Pet is the ideal dragon game for everybody who loves to play addictive dragon legends games. On the off chance that you appreciate playing arcade games then you will love this new free dragon eat eggs game! The main objective of this addictive arcade game is to take control of our Dragon Pet and try to collect eggs to earn points. But, keep in mind that you should not let eggs fall out or you will lose some points and you should not collect green eggs or you will lose one heart. You only have 3 hearts so if you lose them all then our dragon pet will die and you will lose. The game will get harder as your progress on it, but you need to show your reflection and speed skills to complete each level and go to the following one. We know that everybody nowadays has an iPhone smartphone or iPad and need to appreciate the most addictive games on his devices, and that is the main reason behind this free monster legends game that comes with an amazing environment that you will love.